Taylor Kitto lives in Portland Oregon with a Terrier, white husky and as she refers to him, 'her man.' 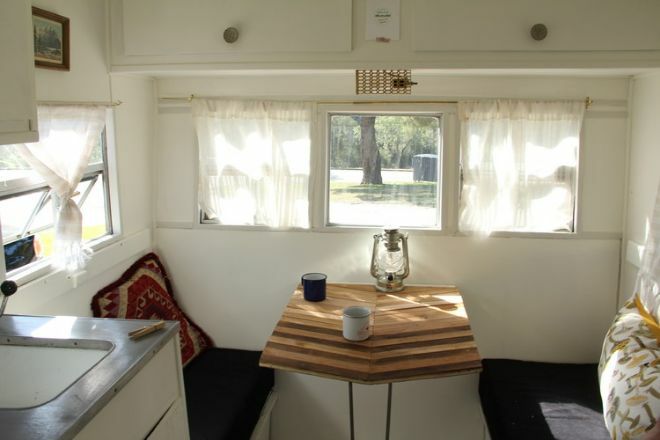 The blogger also owns a Midway 1959 travel trailer, which is a dream come true. 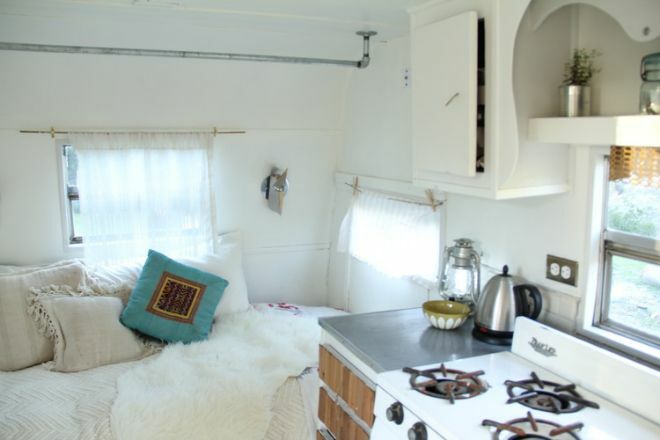 The camper also serves as a pop-up shop for her store Wild Poppy Goods. As a creative person, the process of making the trailer fit for use was just as exciting as the prospect of hitting the road. It wasn’t in bad shape to begin with, just required some TLC. The wood was a bit chipped and distressed though the biggest issues according to Taylor was with the windows which needed to be taken off and resealed to prevent leaking when it rained. The bedroom area was full of dirt grime and spiders but nothing some cleaning and a new paint of coat couldn’t fix. The sea of brown was made ugly with pink cushions, a pink Formica counter and white curtains with red cherries. The countertops were replaced with tin stained counters and a new table installed that was built purposefully by 'Taylor's man'. 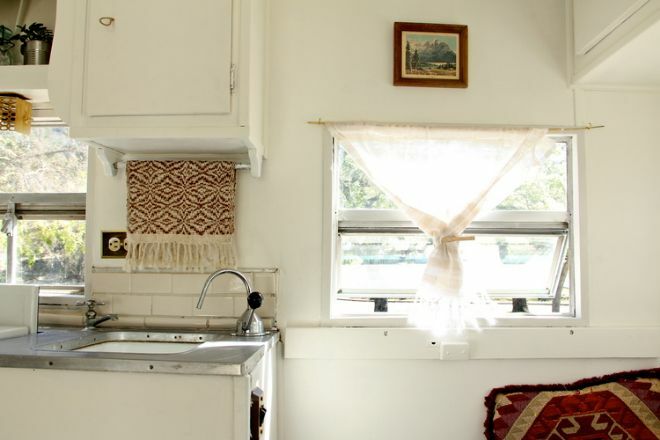 She purchased Turkish towels on Etsy and used them to create curtains. 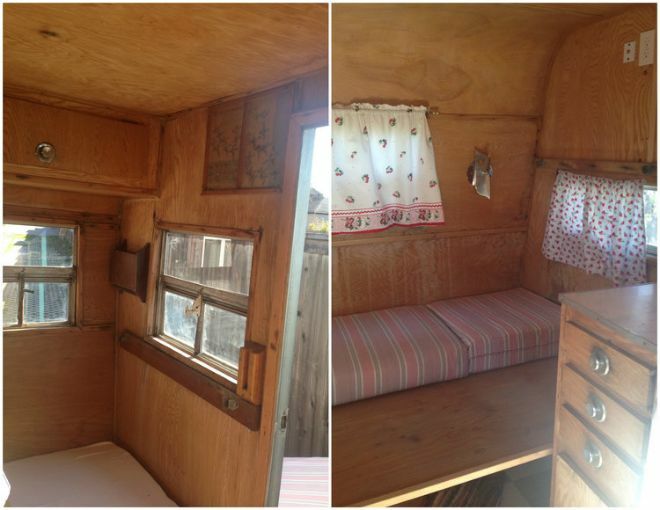 New cushions were done and soon the interior of the trailer was unrecognizable. Luckily for Taylor, the interior didn't require too much demolition. The drawers are the original drawers, though she is considering taking them out and replacing them due to a little rot. A considerable amount of elbow grease, a new mattress and some pillows and the previous grimy bedroom is now invitingly cozy. The kitchen features an under-mount stainless steel sink with chrome faucet. The stove is the original three-burner stove that was in the trailer at the time of purchase. 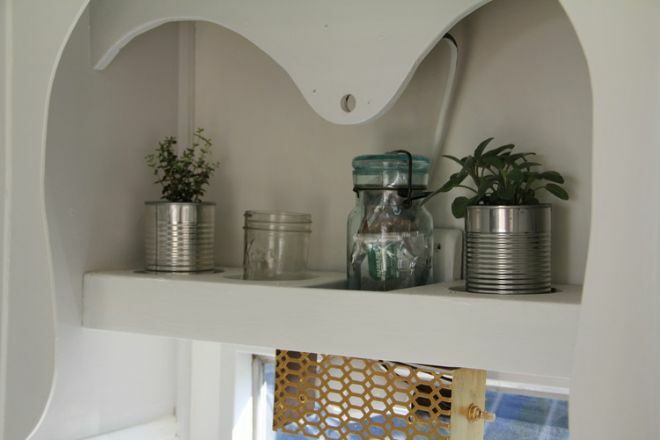 Carefully placed details such as a small hanging picture and some herbs planted in tins finish off the kitchen area. On the other side of the trailer is a simply decorated seating area. The table was built for the space though the seating is what was present in the trailer. Taylor added new cushions upholstered in blue on the seats as well as some plain white curtains. Two pillows, one yellow and the other red add some color to this area. 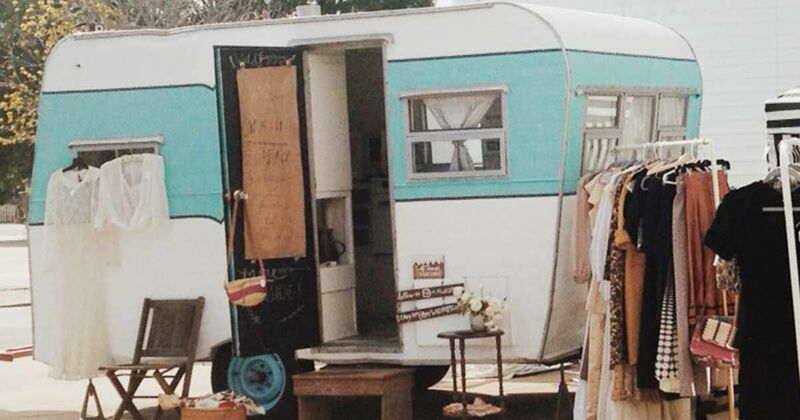 What do you think of this lovely hang-out spot and pop-up shop, all in one renovated trailer? SHARE it with your friends if you'd love to own one like this.